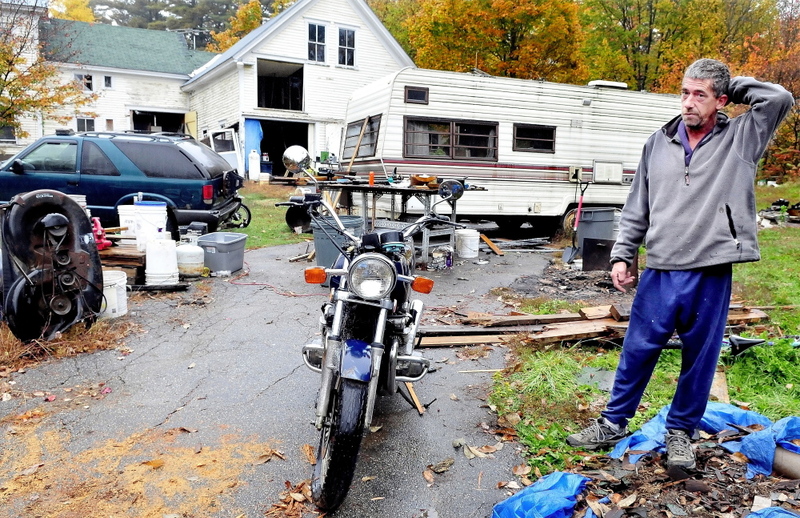 Adams Street resident Duane Pollis, who already owes $9,500 in fines, has until May 30 to clean up an “illegal junkyard” or the town can do it and charge him. A downtown Wilton homeowner who already owes $9,500 in civil fines for having an illegal junkyard has until May 30 to clean up his yard or face additional fees for the cleanup costs. Homeowner Duane Pollis was found guilty in Franklin County Court of violating state and local laws by having piles of lumber, appliances and car parts on his front lawn. Selectmen set the date for the cleanup last week. Along with being convicted of violating the state junkyard ordinance, Pollis was the first person to be fined for violating a property maintenance ordinance narrowly passed in June, which allows a minimum fine of $100 per day for violations. Pollis has said everything in his Adams Street yard has a purpose. He said he planned to recycle, resell or use every car part, 5-gallon bucket or piece of wood in the yard. As part of the court ruling, the town got a permanent injunction requiring Pollis to clean up the property and keep it clean. If Pollis does not clean the property after the judgment, the town also is requesting permission to enter Pollis’ property, remove the material and bill him for the cost. Wilton Town Manager Rhonda Irish told selectmen last Tuesday that the town also is tallying up the attorney fees associated with the case and plans to bill Pollis for the costs. In the case, Pollis lost by default, according to court documents, because he never responded to the case in writing. Town officials said Pollis never contacted them. Irish said previously that the town has contacted other residents in violation of the maintenance ordinance and has been able to work out a plan to help clean their property, so civil action wasn’t necessary. Pollis has said he cannot afford to pay the fine and didn’t respond to the case because he does not have a car to drive to the court, money to hire an attorney or a phone to call the Town Office. Defendants are guaranteed an attorney only in cases in which the defendant is facing jail time. He said his girlfriend signed the complaint for him when the civil deputy couldn’t get in touch with him, and he didn’t think that signature counted or allowed the procedure to move forward. He said the town has bigger blight problems to worry about, such as the decaying Forster Mill down the street from Pollis or the contaminated former tannery on U.S. Route 2. The town recently got a grant to clean the tannery and is in a civil suit to have the mill torn down. The selectmen unanimously voted to seek the $100-a-day fine starting Oct. 3. Voters at Town Meeting in June passed the ordinance by a 10-vote margin after lengthy debate on whether it would place a burden on poor people and violate personal property rights or was necessary to protect neighboring property values and remove hazardous material. Examples of good repair listed in the ordinance include a yard free of trash and “offensive material,” no missing shingles or crumbling brick exteriors, and removal of all debris considered a health and safety hazard. Language governing peeling or damaged paint was removed from the article by town officials.